I insisted that we provide refreshments for the Poe-try Reading, an event we are hosting at Charming Books, the magical bookshop that I share with my granddaughter Violet, to celebrate the works of Edgar Allan Poe. The reading will be held during the Cascade Springs Food and Wine Festival, the most anticipated event in the village each autumn. I've enlisted the help of La Crepe Jolie, the French café down the street from the bookshop, and among the many treats that café made for the event are lemon madeleines, My favorite cookies! 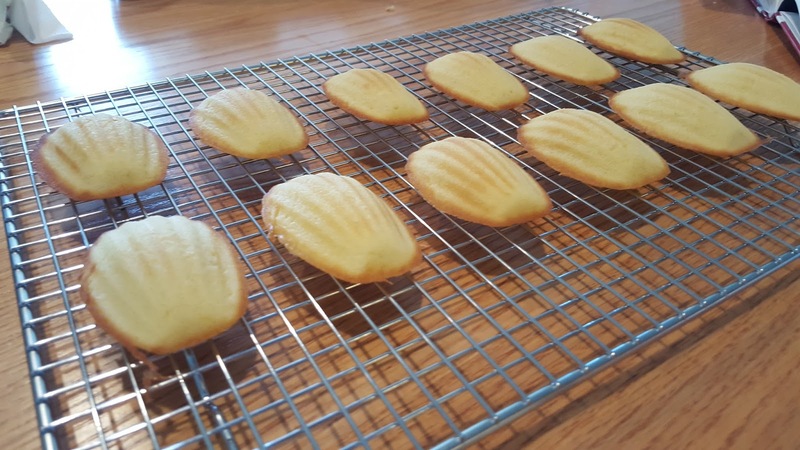 There's nothing better with a cup of tea than a lemon madeleine. Enjoy the recipe! 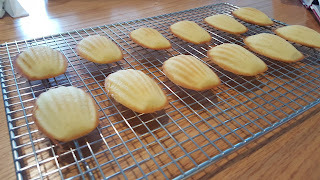 1 -Preheat oven to 375 degrees F and butter and flour madeleine molds. 2 -In a large bowl, mix sugar, eggs, and butter. After these three ingredients are well blended add flour, baking powder, lemon, vanilla. 3 - Spoon batter into molds 3/4 full. Bake 10 minutes at 375 degrees F.
4 - Remove from molds and cool on a rack. 5 - While still warm, dust with powder sugar if desired.